Moster Turf has the experts you need for laying sod and growing sod. Your turf installation starts with certified seed. It is pure and will reduce the chance of outside contaminants. We then patiently grow your sod on our own farm in high-fertility soil, nurturing it daily during that critical first year to ensure health and longevity. Through our careful growing process, our net-free sod has a more defined root structure, assuring quicker rooting for your lawn or athletic field. Our net-free sod takes a minimum of one year to grow, so you are guaranteed a mature and durable product when the time comes for turf installation. One look at our product and sod installation will prove that your patience pays off. As a part of our great customer service, we take the time to watch and wait for the sod, so you don’t have to. You’ll receive the finest Bluegrass sod blend or Turf-Type Tall Fescue sod blend. We’ll properly maintain it and deliver it fresh to you. Our fresh cut sod is available for pickup or delivery; the choice is yours. 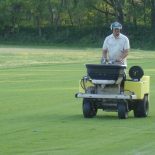 We are continually working to create the best blends of Bluegrass varieties to be the most durable in the climate in Kentucky, Ohio and Indiana. You can rest assured that our sod installation is always durable and high quality. This blend was chosen for its darker green color, drought resistance and disease tolerance. Small sod rolls – 9 sq. ft./roll, measures 16” wide x 81” long. Each roll weighs approximately 25-35 pounds. A pallet of 60 rolls is equivalent to 540 sq. ft. and weighs 1500-2100 pounds. Big sod rolls: 360 sq. ft./roll, measures 42”wide x 102’ long. Each roll weighs approximately 1500 pounds. Not sure how much sod you need? Just give us a call, and our turf specialists can help you figure it out. A beautiful lawn stems from superior seed. That’s why Moster Turf offers only premium-quality blends that are far superior to those sold at discount or home improvement stores. We select the best seed varieties for your conditions to ensure a dark green color, disease resistance and drought tolerance. Both our Moster Turf Kentucky Bluegrass and Moster Turf Tall Fescue blends are designed specifically for use in Kentucky, Ohio and Indiana. The seed fills in nicely and works well in full sun and in partial shade. Purchase our seed and fertilizer for DIY application, or ask us to seed and fertilize for you. You may want to consider a combination of seed and sod, particularly in larger square footage areas. This blend was chosen for its darker color, drought resistance, and disease tolerance. This blend was selected for its drought resistance, as well as its disease tolerance and dark green color. It is also equipped with rhizomes for a quick recovery in case of damage. Our fertilizers are carefully selected to be the perfect blend to maximize the performance of your lawn. Starter Fertilizer: Properly balanced for use on new seeding or newly laid sod. Late Spring (Mid April – May): Crabgrass control and fertilization for summer needs. Grub Control (June): Grub control with fertilizer. Early Fall (September): Balance Blend to help recover from summer stress. Mid Fall (October): Optional for continual growth. Winterize (November – December): Higher nitrogen for root growth and early spring green up. Our sod installation experts are ready to give the exterior of your home or business the beautification it needs. We also offer sod laying for athletic fields. If you’re in need of any of any turf installation services, please feel free to contact us today.